Business Education prepares the teachers who provide instruction in a variety of business courses in Indiana junior high/middle schools and high schools. At the junior high/middle-school level, most of the business emphasis is on technology literacy. However, some business foundations units are included in the Middle School Curriculum. 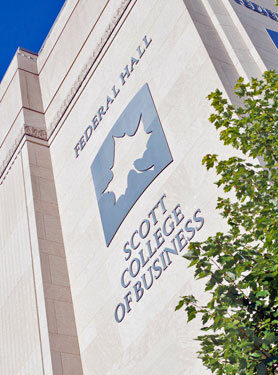 At the high-school level, there is a broad array of course offerings in business designed to prepare students for success in entry-level business employment, to provide college-bound students with a foundation upon which to pursue an academic program in a business discipline, and to provide knowledge and skills needed for conducting personal /business/financial affairs. Business Education majors gain part of their professional preparation through courses and field experiences provided by the College of Education. The Business Education major meets the licensure requirements for teaching business courses in Indiana public middle/junior high and high schools. The demand for well-trained public educators is increasing because of the current retirement trend of "baby boom" generation teachers. Also, business teachers are in demand by businesses and other organizations seeking individuals who are technologically literate and capable of training new employees in business communication skills and information processing applications.